We see too many workplace computer injuries that could be avoided. Prevention is definitely preferable over cure. 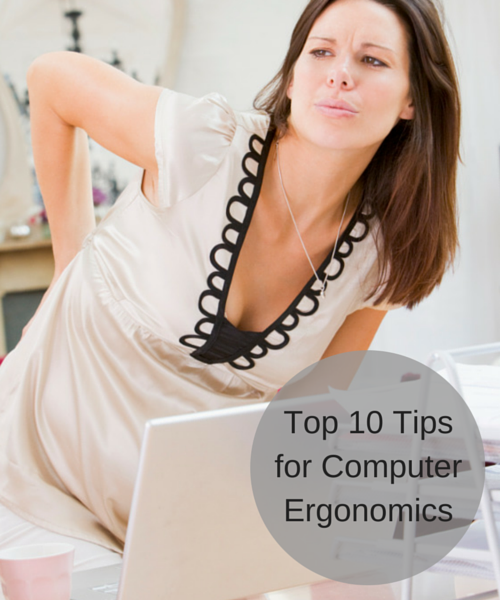 Below is a great article from Entwistle Power outlining the most important and effective Top 10 Tips for Computer Ergonomics. Humans were not meant to remain in static positions for long periods of time. Taking regular, brief breaks throughout the day allows us to avoid maintaining static positions, awkward postures and repetitive motions that lead to injuries. Consider taking a 2-3 minute break for every 30 minutes of work. For those who are required to maintain sitting positions for long periods of time at their workstation, the rule of 90 degrees should be followed. This means that while sitting at a desk, a person’s knees, hips and elbows should each be resting at 90 degrees. Chair height should be adjustable such that the back is firmly supported, thighs remain parallel to the floor and the feet are able to rest flat on the floor or a foot rest. Regular position changes are important to avoid injuries. Whether it be taking a break to walk to the filing cabinet, or standing while having a phone conversation, make sure that regular changes in body position occur over the course of the day. Many jobs today require long periods of screen time. If this is the case for your workstation, make sure that there is an arm’s length distance between your eyes and the screen. Also make sure that the top of the monitor or screen is level with your forehead. This allows for the head and neck to remain in a neutral position by avoiding continued periods of looking up or down. Whether it be having your chair tucked in close to your desk, or the location of your keyboard and other frequently used items like the mouse and telephone, ensure that these items remain close to the body. This tip goes hand in hand with the use of regular breaks and position changes. Engaging in gentle stretching on a regular basis over the course of the day can address body stiffness and muscle tension in areas like the neck, shoulders and back. It also serves as a preventative strategy to keep the body moving and avoid injury before it happens. Whether it be for keyboarding, use of a mouse or desk work, it is important that wrists are maintained in a neutral posture. This avoids potential for overuse and injury due to fixed postures of flexion. Improper lighting at a workstation can lead to glare, visual strain, headaches and reduced concentration. Make sure that lighting is neither too bright nor too low and that the location and angle is appropriate for the specific work task. Working Health can help if you have more specific questions related to implementing ergonomics in your workplace, for a specific job or employee. Please call us on 0800 430 209 or Email Us today to discuss your workplace computer assessment and vision screening requirements. Has this post about Top 10 Tips for Computer Ergonomics been helpful? Please SHARE so that others can enjoy it too.